Improve your golf game and mental strength with in-depth mental training that integrates mind, body, and spirit. Learn to increase your focus and concentration with advanced meditation and breathing techniques, learn course management skills, and improve your ability to overcome mental breakdown. Also, clear out old self defeating psychological patterns with self-hypnosis and guided meditation techniques. Lower your scores by 3 to 5 strokes. It is unequivocally, the finest application of the mental side of this crazy game that I have listened to. I particularly related to the mental image aspects of the CD. Like many, I am certain that a golfer must first “see” a shot in his mind before he can properly and consistently execute it. Beyond that, the golfer must believe they can hit the shot. From a personal standpoint, I know that my mental image of the shot on a par three is much more vivid than on the others shots. While I still don’t know exactly why that is, I feel that this tape will assist me in taking this tremendous assest to the other swings. “The Zone” will now be a part of my pre-round routine. By applying what I hear on the tape, it is now my hope to shave a few shots of my total, but more impacting, maybe add a few years to my life! I was fortunate enough to receive a copy of the CD from Dr. Mann a few months ago. I have listened to and used the techniques covered in the CD. With these methods, I have established a new outlook and approach to the game of golf. I have always been fascinated by the power that the mind has over the game. 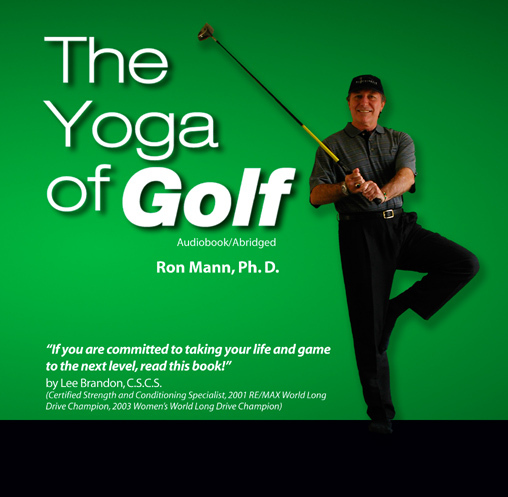 This CD and the techniques included in it can benefit all levels of golfers. Great golfers are simply ordinary people who continually put themselves in a learning environment and are willing to risk the “tried and not-so-true” in the face of unpredictable outcomes. Ron Mann’s “Find the Zone” is that kind of learning adventure. He presents the golfer with the opportunity to play freely and creatively and to explore new horizons which may give benefits beyond the game itself. According to Ron Mann, technique is only one facet of your golf performance; your mental state is another. While this isn’t exactly a revolutionary concept, Mann actually attempts to give you the mental tools needed on the course. By teaching relaxation, visualization, and concentration techniques, this CD hopes to lessen the stress (and strokes) that find their way into your game. On his introduction to this three-track CD, Mann explains this concept and the exercises that follow. The second track features Mann taking you into a hypnotically induced trance state through breathing exercises. The key here is focusing your energy, a habit that you can hopefully bring to the fairway. Does it work? That depends. Those cynical to New Age principles may have trouble following Mann’s instructions, but the rest of us duffers can’t hurt from this disc. Mann talks us through the perfect swing (you have a perfect swing, don’t you?) and how to make solid contact with the ball, basically walking us through the course and all the difficulties that await. And, with golf courses at their most crowded and green fees ever increasing, a little relaxation can go a long way. The CD liner notes promise to take at least three strokes off your game. Not bad! I wanted to let you that I recently purchased your CD “Find The Zone”. I listened to it the other night and took many notes. I played the other at my home course now, The Navy Golf Course at Seal Beach. I am a reserve in the navy. I played 7 previous rounds there and nothing lower than a 101. I had averaged 107 with all the scores. I took what notes I made from your cd and applied them the day I played. I went out there and blew all my stats away and also shot a scratch 87. I wanted to thank you for your time it took to make the cd and also teaching many things that I did not know. I truly believe in your teachings 100% plus. I recommend your CD to anyone that I know that plays golf. 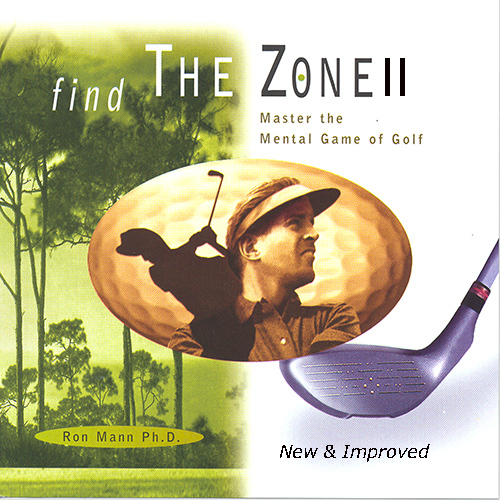 Find the Zone II: Master the Mental Game of Golf addresses the most difficult aspect of Golf, the mental game. Once you have obtained a basic level of skill, the rest is in the mind. Peak performance results in a state of consciousness called the zone. This program teaches advanced techniques for relaxation, visualization and positive mind states. It is guaranteed to take at least three strokes off your game. Track One: Dr. Mann provides a conceptual basis for the power of breath, visualization, imagery and positive suggestion to effect optimum performance. Track Two: Dr. Mann takes you into a hypnotically induced trance state and teaches you how to stay relaxed and techniques to shift your consciousness into your Higher Mind through your breath. He also helps you develop a process of mental visualization and kinesthetic imagery to help you enhance your golf performance. This track concludes with a number of post-hypnotic suggestions that promote a positive and optimistic mental state. Track Three: This is a short hypnotic stress reduction exercise that was aired on both the domestic and international American Airlines audio channel. This new release provides three times as much information and training aids than the first CD. It also discusses current research on sports psychology and quantum physics, and a very honest discussion of the deeper psychological issues that prevent success. Disk 2 has expanded guided meditations for concentration, stress-release, visualization training and inner mastery. BUY NOW! Digital Format is $31.00. Use the secure network of PayPal to make your purchase. Once you have paid, you will be directed to the download page on this site to access two zip files (Disc 1 & 2). Buy Now at Amazon.com. Use the button below to go to their website for the CD. (Great price if you are an Amazon Prime member). Also, please look at “Dr. Mann’s Books ” as all the books relate to mental strength.